OAFE - Points of Articulation: What a Croc! But there's more going on than a cursory glance at the back of the box would reveal. The Suicide Squad line is a tangled mess of series, waves, re-releases, exclusives, and alternate Build-A-Figure parts. So we're going to take a look at what all is available, and what you get with it. Normally, this would be where things ended. But this line is not normal. To begin with, notice that Croc's hands are bare in the above image, yet the included BAF pieces have his hands wrapped up. As you can see, figures 4, 5 and 6 on that list are figures 1, 5 and 2 from the mass market. 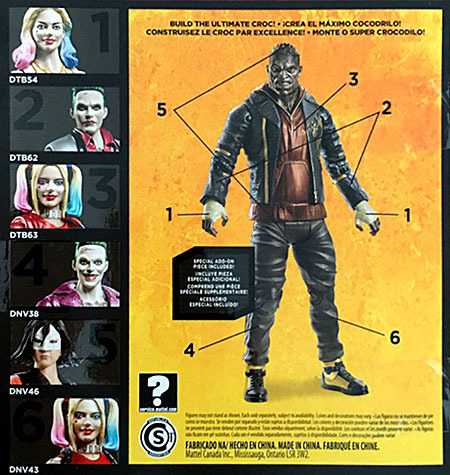 And though the packaging doesn't show it, you'll also need to buy Batman, because the hoodie that comes with TRU Joker is just a hollow piece that slips over the existing torso. There are also exclusive figures of Diablo and Rick Flag available at Walmart, but neither of those come with BAF parts. 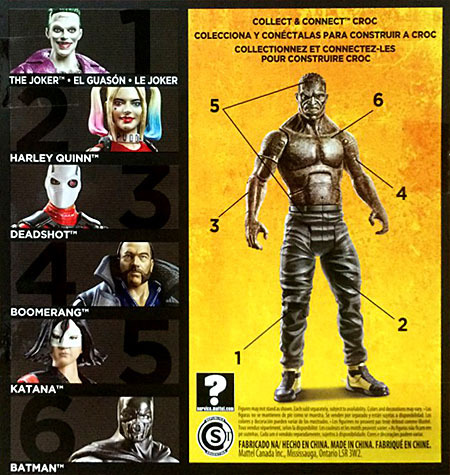 So to build a plain Killer Croc, you have to buy six figures. To turn him into "the ultimate Croc," you have to buy three more exclusives. The arms appear to be swappable, so you shouldn't have to double-dip on the torso and legs. Still, if you want the whole deal, you're going to end up with a Batman who's pretty much identical to the BvS one who's already pegwarming everywhere, three Harley Quinns, and at least two Jokers (plus a third if you get the SDCC set). That's not a good assortment of characters.